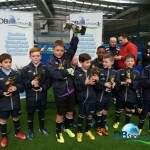 AFTER the success of last month’s debuting Manchester Easter Cup Small Sided Games Blitz, DB Sports Tours are already planning to go bigger and better for next year’s tournament – and we are inviting clubs to snap up their places right away. Twenty four clubs from Ireland and England – a unique and first-time ever mixture of schoolboy, semi-professional and professional clubs – lit up one of the top indoor facilities in Manchester. Originally intended to be an outdoor, on grass, competition, the severe and unfortunate snowfall could not stop the organisers providing Ireland and England’s best young talent the opportunity to shine – and boy did every team and player seize the chance (check out the below videos). Next year’s later kick-off date – April 11-14 – will hopefully allow for better weather and the chance for the expanded tournament to flourish outdoors. Double the entrants are expected for the second year as we hope to build on the influence the likes of Arsenal Soccer Schools, Blackburn Rovers and Bury FC had on the competition will be multiplied in 2014 with more big names coming onboard to take on Ireland’s brightest youngsters. DB Sports Tours Managing Director David Berber, who only this week unveiled another debuting tournament, the Small Sided Games Summer Cup to be held in Dublin in August, is extremely excited about building on a remarkable 2013 for the games youngster stars come this time next year. “While this year’s debuting Manchester Easter Cup Small Sided Games Blitz was without doubt a huge success we immediately want to make sure next year is even bigger and better,” he insists. “We gave some of Ireland’s best young talent the chance to take on their piers playing with massive names in England like Arsenal and Blackburn – and the Irish kids really impressed. “The snowfall that forced the tournament indoors was unfortunate so next year are confident the later date and the expansion to a four-section tournament will make for a greater success story. There were two sections to this year’s debut tournament – Under-10 and Under-10 – with Under-9 and Under-12 joining up next year, and the Irish teams more than held their own. Shelbourne, Peamount United, St Francis FC and the North Dublin Schoolboy League were just some of the domestic names to impress across the water on front of scouts from all the top Premier League clubs watching both days. Six wins from six saw St Francis’ Under-11s win their section, with top scorer O’Neill Ali (13 goals overall) stealing the show right up to the final, where goalkeeper Caelan Clarke won the Man of the Match award for showpiece display. The NDSL brought 39 players in total to the tournament, with one of their two Under-11 sides reaching the Plate Final against the mighty Arsenal and winning on a penalty shootout. The league’s Under-10s scored an incredible 47 goals over the course of their weekend’s action and beat Chester Academy in the cup final eventually. NDSL Director of Coaching Mitch Whitty insisted: ” The weekend was about the players and to see every player smiling, enjoying themselves and having fun over the weekend was excellent.